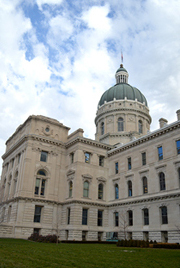 Before the final release of the state’s budget for fiscal years 2016 and 2017 later tonight, House Speaker Brian Bosma and Rep. Tim Brown, R-Crawfordsville, explained a few details regarding the new school funding formula. As predicted, there will be a 2.3 percent increase in funding across the board, a $464 million bump over the two years, including an overall increase in per pupil funding for every student in the state. The area where there was the most negotiating between the House and Senate was with the money given to low income students, called complexity. The budget uses the Senate’s proposal on how to define these students and fund the complexity dollar amount. Rather than giving schools more money based on the number of students who qualify for free or reduced lunch, as in the past, complexity money will be awarded based on children whose families qualify for one of three federal low-income services – foster care, the Supplemental Nutritional Assistance Program (food stamps) or Temporary Assistance for Needy Families (TANF). This measure will be phased in over the next three years. Sen. Luke Kenley, R-Noblesville, told StateImpact a few weeks ago the Senate prefers these qualifications because the federal government will automatically inform the Department of Education of these students, rather than making the school approach families to verify the numbers themselves. Legislators added English Language Learners to the complexity index, doubling the money to schools that serve large portions of non-native English speakers. Before, ELL students were funded through a separate pot of money not tied to the formula. By moving to this system, Bosma says urban schools that were upset with with the new formula because they would lose money will see that blow softened. New money for charter schools is also included in the budget. In addition to their typical funding, charter schools will be given $500 for every student attending a “high performing” charter school, which is defined as a charter school receiving an A, B or C on the A-F accountability system, according to the budget. Charters schools receiving a D or F can also qualify for this money if they prove their students perform as well or better than nearby traditional public schools. In total the state expects that additional per pupil spending will add up to $10 million. This is a significant drop from Governor Pence’s ask of $40 million for charter schools, one of his legislative priorities since the beginning of the session. Charter schools do not receive property tax money like public schools, which is why Pence pushed for the increase. The budget also includes a $100 tax credit for teachers to supplement what they spend on school supplies. The Senate’s proposal of including bonuses for high performing teachers also made the final version of the budget.